The leading cellular material in the foam technology market, thanks to its clear technological advantages. 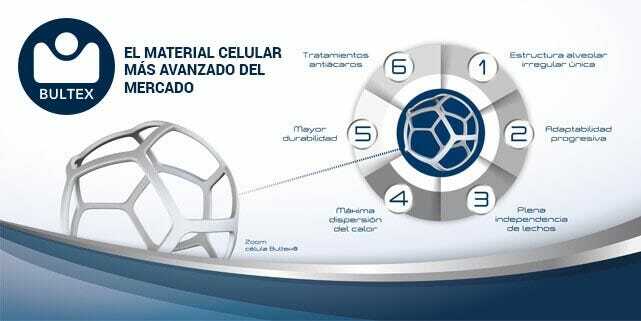 Bultex® is the leading cellular material in the foam technology market, thanks to its clear technological advantages. Millions of tiny individual elastic cells provide proportional resistance to body weight for a perfect balance. Its adaptability, resistance and breathability make it the ideal core for the mattress sought by the most demanding consumers. It’s a step forward in the concept of sophisticated rest. Bultex® is manufactured according to a different process, from different materials and using the latest technologies in innovation and development which give the material exclusive properties. The cells are more irregular and different sizes, permitting optimal elasticity in response to your movements as you sleep. The sleeping zones are completely independent. Your movements do not disturb your partner. Bultex® is a material that is 95% permeable to air. The cells that make up its structure are entirely open and interconnected, promoting optimal natural ventilation. This facilitates ideal air circulation. Bultex® mattresses are more durable than other products in their category. 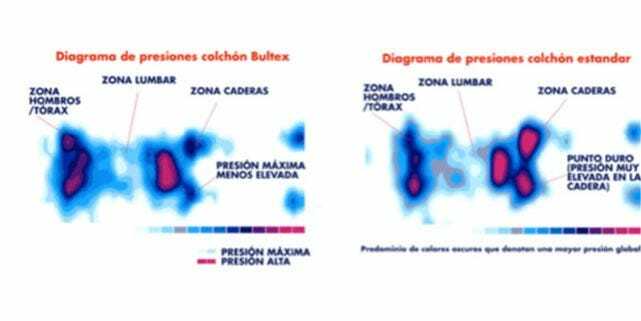 They have better compression test results, meaning that following extreme laboratory tests simulating 10 years of mattress use, the results for Bultex® are noticeably better. Bultex® is also at the top of its category in terms of what is referred to as the ‘comfort factor’, which measures the material’s capacity to return to its original shape after being deformed. All the scientific studies agree that Bultex® demonstrates the best performance for supporting different weights (when we sleep) and then returning to its original shape (when we get up). It is a healthy material. It provides complete hygiene during sleep, thanks to its exclusive Barrera Total® (Total Barrier). An exclusive anti-mite, bacterial and fungal treatment is applied to each and every mattress component, ensuring complete hygiene. Bultex® is the most advanced foam technology on the market. The design of its cells favours progressive adaptability, with absence of movement and the greatest level of inner air circulation on the market. To better understand the differences between Bultex and other foams, a good approach is to look at the design of one of its cells. The cells are more irregular and of different sizes. Scientific studies* confirm that the more irregular the cellular material, the better the ELASTIC performance of the material. A perfect gem-like foam structure with twelve faces. Bultex® can be said to provide optimal elasticity in response to your movements when you sleep. * Study by X. Zhu, Jr.Hobdell & AH.Windle - Department of Materials Science and Metallurgy, Cambridge University. Firm comfort: for those who require extra support. Adaptable comfort: to account for the numerous times you change position when you sleep. Both static and dynamic performance. Bultex® is manufactured with different levels of support, offering a wide range of sensations. Its SAG factor gives Bultex® proportional adaptability in the areas of the body that weigh the most, such as the hips. It resists sagging to ensure healthy back posture and gently reacts to surface pressure, adapting pressure-free to the less heavy areas of our anatomy, such as arms and legs. In this way, it always ensures correct spine posture. Furthermore, Bultex is manufactured with different types of profiles that improve the mattress features, making it softer in the shoulder area and providing more support in the lower back area to optimise the response to pressure. Materiales acogedores en los acolchados y una construcción especial facilitan la ausencia de traslación de movimientos de una parte a la otra de la cama. Bultex® has the highest permeability index on the market, with breathability levels of 95%. Its great resilience* (resistance) as a material permits an especially open molecular structure. This means that air and moisture circulate freely inside the core, providing a hygienic bed with temperature regulation that makes it cool in summer and pleasant in winter. The origin of Bultex dates back to the 1970s. At an upholstery foam manufacturing plant, the laboratory mixed several components together in a bucket. The result of the chemical reaction was a cellular material with astounding properties. Different tests led to improved results: a foam with exceptional resilience. Bultex was released in 1984, the same year that the Bultex brand was launched for use in the manufacture of mattresses. Research teams, in close collaboration with the University of Ghent (Belgium), have carried out relevant population studies on body shape. This research allows us to produce mattresses designed according to comfort parameters related to the different types of body shape that exist.